I received these as a gift for the holidays and am sooo in love! Stemless wine glasses are my favorite! In my eyes yo ucan never go wrong with giving party type gifts. RSVP International wine glasses are made of stainless steel making them green and sustainable. You can even recycle them if ever you need. Save 50% on the Eco Friendly Product of the Week at GreenCupboards.com. Shop Now! Product Description: Limit 2 per customer. These wine glasses – minus the stem – are beautiful for serving red or white wine while holding the beverage’s temperature longer than glass or crystal. 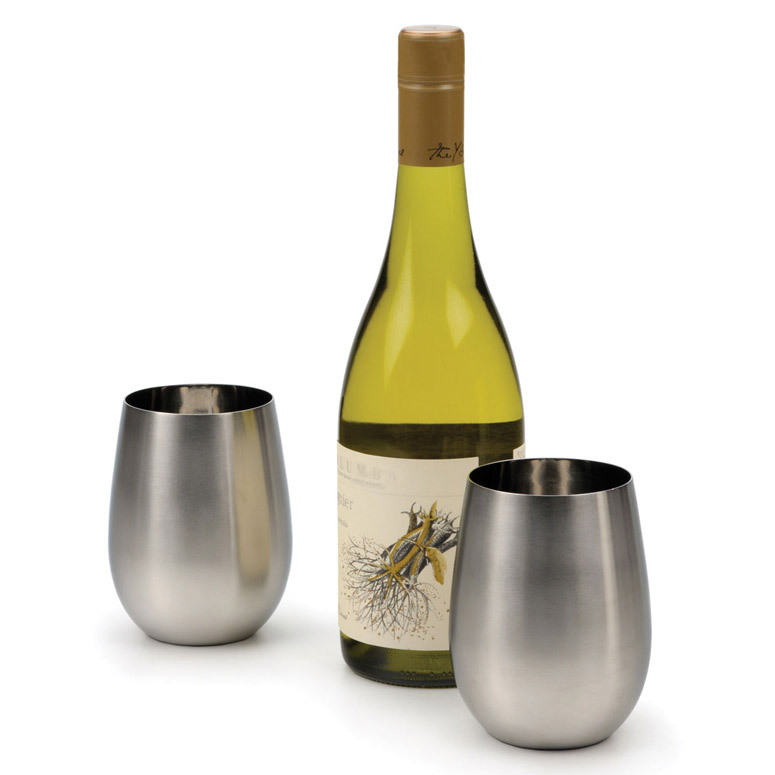 Made from 18/8 stainless steel with a beautiful satin finish exterior, mirror interior and 18-ounce capacity. Use them not only for wine, but also for juice and frozen drinks. Perfect for use at the poolside, on a boat, camping or on picnics! The glasses have an 18 oz. capacity, keep white wine chilled longer. They can be used not only for wine, but also for juice and frozen drinks. RSVP stemless wine glasses are dishwasher safe. RSVP International strives to make quality products that are eco-friendly, safe for culinary use and long-lasting. Stainless steel is rust resistant because of its chromium content. Since stainless steel doesn’t rust or corrode like other metals and because the metals in stainless steel (nickel, chromium, molybdenum) don’t leak into your food when heated, dented or scratched, stainless steel products are used and recommended by chefs all around world. Stainless steel is a durable metal that keeps its integrity longer than most other cooking materials so you can keep your cooking utensils longer while adding less to landfills. Although many people don’t know this, stainless steel is 100% recyclable unlike many other cooking materials. In fact, on average 60% of the metal in each stainless steel product is obtained from recycling. It can be melted down and recycled, while other materials usually get put into land fills due to a lack of recycling facilities or an inability to recycle certain materials.They make products that stand the test of time, reusability is essential. RSVP recycles and composts at their manufacturing facility whenever possible, keeping cardboard boxes and paper out of landfills. They have a large container/crusher that they call Chewboxa. Once Chewboxa is full, it is taken to a local recycling center for processing. RSVP is also conscious of their use of plastic and paper in the packaging of products. They use as little as possible while still sufficiently protecting products from damage. RSVP analyzes green trends in order to make eco-friendly products of the future, available now. For instance, RSVP has been making their stainless steel one gallon composter since 2000, long before composting was so popular. Thanksgiving is almost here and I am beyond excited. This is a great time for the family to get together and spend time. I feel like we get so consumed with cooking and entertaining that we forget to just be thankful. I know you have all of these options to buy less, cook less, use less, recycle more, reuse and reduce but what about remembering what this pretend holiday was invented for. In all of the confusion and orders we forget to be thankful for all of the good we have. We forget that we are lucky enough to have a holiday devoted to being thankful where that option is valid for us. I know I can sit here and tell you all of the wonderful ways you can be green and save our environment but what I think we all forget is the spirit of tomorrow and what we can all do to be thankful. Be glad you have people to spend the holiday with. Be happy you have food to enjoy and most of all enjoy the memories that Thanksgiving will create. Those are things that stay with you and what make holidays worth having. Even if your family annoys you, stresses you, makes you cry they are yours and you can make the best of it. Be thankful this year for everything you do have and for anything you want to have or be. I love making my own decorations especially if I can reuse them year after year and for more than one occasion. You may have real or fake pumpkins left over from Halloween so why not put them to good use. If you have crayons that have about had it and are looking for something to do with them this is the perfect project for you and your family. This is a great project for schools or parties as well. Here are two examples on how to have fun with designs! 1. Make sure to remove all labels from the crayons as they will not be helpful as the crayons are being melted. 2. Make sure the pumpkin is clean and isn’t spoiling. You don’t want to spend time decorating it for it to go bad after your hard work. 3. Cover the area you are working on with a cloth to make sure you don’t drip on anything important. 4. Break crayons in half, you won’t need a whole crayon for 1 pumpkin. 5. Glue the crayons to the top of the pumpkin, they may not stay still otherwise, if you want to do a drip effect you can hold the crayon and heat it to drip in a pattern of your choice as well. 6. Once you are ready to melt go crazy! Make any design you want drip separately or together. Have fun with it. I always say get creative so if you have fun things you want to add to this craft go for it! Use glitter, buttons, broken pins, ribbons or anything you have been looking for an excuse to make use of. Add whatever you want to the pumpkin while the drippings are still wet. Glitter or even sequins would be fun. You could go get leaves, twigs and acorns. Make it your own! It’s that time of year again! One of my most favorite holidays of the year and one of the most wasteful holidays as well. We all know to recycle our decorations, swap or handmake costumes and purchase things with as little packaging and wrapping as possible. As educated Greenies we also know to make sure if we have to make a purchase to make it as ethical as possible. So what are some other ideas for making your Halloween green? I am fresh out to be honest. I have searched far and wide and besides the endless list of craft ideas I don’t see much but the same recycled information. So this time I am asking my faithfull Greenies to give me ideas! I want to know what you do or what you think we can all do to make our Halloween more ethical! No idea is to small or silly! I want to hear them all. The 4th of July is upon us again. I have been scouring blogs, articles and newscasts to find new green tips for your 4th. Here are some things that have been mentioned before and some new things I didn’t even think of. 1.We know Fireworks are no beuno! Besides the noise that scares outdoor animals and are harmful for the environment not to mention dangerous, did you also know that the 4th of July is the #1 day pets run away? I was unaware but I did recently find this out. 2.You know to make sure to use reusable/recyclable utensils for the event. If you are having a big party there is no need to have big garbage. There are plenty of affordable options for serving. 3.Make as little waste as possible. Give away left overs and don’t over cook. I know for parties people are always concerned about not having enough food. Purchase items you and your family will eat even after the holiday. You don’t have to make everything right now all at once. Make food in shifts. If people are still hungry you can always make more. You also don’t have to leave all of the food out. People will eat just because food is sitting there. Put out smaller portions. You can save on money and waste. 4. No one likes bug and this time of year there are plenty especially when there is food around. Try using natural insect repellents such as natural citronella candles, or essential oils such as cinnamon, castor oil, rose geranium and orange oil. You can find plenty of DIY repellent recipes online. 5. You know going local, organic and as meat free as possible is a great way to lower your carbon foot print. Make sure to do your best to adhere to those rules but also remember having to travel a far distance or spending money on expensive products sort of defeats the purpose so be reasonable with your decisions. 6. As your evening winds down you will be tempted to turn on all sorts of lights and light all kinds of fires. As tempting as fire side snacks seem there are many carcinogens released into the air depending on what you are using to start this fire. Use natural products ie plain old wood from your back yard. The same goes for the charcoal on your grill people, propane is a much more green alternative! Keep solar lights handy. If they are already outside of your house during the day you won’t need to turn on any additional lights. You can save on your energy bill as well. 7. Hand make and save your decorations. If you must purchase decor then go for sturdier options that will last for years instead of ones that might get ruined or not last the day. Making the decorations is a super fun option and activity everyone can share in. You can make it a fun family tradition.